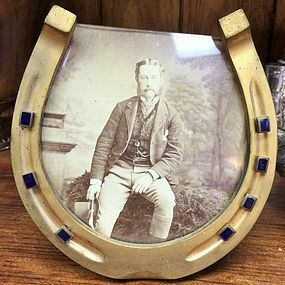 Fabulous gilt metal horse shoe picture frame.7 Blue enamel horse shoe nails for good luck. Measures 5" tall x 4.5" wide. Wood backing and easel. Very good condition considering this dates back to late 1800's. Minor wear to gilding, otherwise almost perfect. Includes original photo which measures approx. 4" x 4", cut into a horseshoe shape of course. Heavy piece, solid metal horse shoe.